One of the toughest things about starting out on an acoustic guitar – aside from the actual learning – is deciding what model to purchase. Buy something too expensive and you could be wasting money, especially if you don’t stick to it. Buy something too cheap and you may not enjoy playing on it. Enter, the C1 from the renown Spanish brand Cordoba’s more budget-conscious line Protege, which strikes a nice balance between quality sound, comfortable performance and good value. Firstly, it’s worth noting that, while we are reviewing the full-sized 25.6” scale length model, the Protege C1 also comes in child-friendly quarter, half and three-quarter sizes. 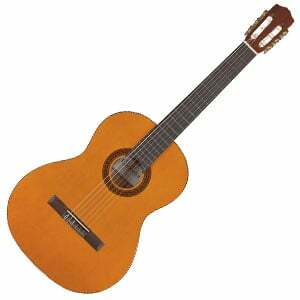 The C1 is instantly recognizable as a classical non-cutaway nylon-stringed guitar, crafted with laminated tonewoods – a fan-braced spruce top with mahogany back and sides. The body features a high-gloss polyurethane finish, which is slightly less yellow when holding it than some pictures may suggest. Joined at the 12th fret, the neck is also highly glossed, and is made from mahogany. This comes fitted with a rosewood fretboard and 19 frets, with inlay markers on the side of the neck. The Hauser-style wood-inlaid mosaic rosette finishes off this attractive guitar nicely – hard to fault on looks and feels well-built, even though it’s made in the Chinese factory. This is a solely acoustic guitar, so there are no electronics on offer, but it comes fitted with some decent components. For example there is a rosewood bridge, a two-way truss rod for neck adjustments, and six nickel-plated tuning machines with pearloid buttons, that combine to offer a traditional look and feel. 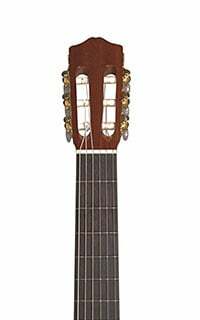 The C1 also comes shipped with premium Savarez strings – as you’d find on Cordoba guitars in the higher price ranges – and a soft gig bag for easy transportation. This C1 really sings, and offers beginners more tone than you may know what to do with! Very well balanced thanks to the spruce top, while the mahogany back and sides offer some mellow warmth. It projects very well, and notes are articulate and sweet. In fact, it genuinely rivals some guitars twice its price in sound quality. For around $160 you’d be hard-pushed to find something that can offer the sound and playability that this Protege C1 delivers. The tone and craftsmanship isn’t as perfect as you’d get with a made-in-Valencia Solista model, but then again you aren’t spending nearly $2000 on it. For a beginner looking for something that will last them for a good few years of practice, the Protege C1 is sensible model to consider. For more info about the Cordoba Protege C1, click here.